Can Tho (VNA) – Prime Minister Nguyen Xuan Phuc joined a gathering in the Mekong Delta city of Can Tho on April 6 to celebrate the Chol Chnam Thmay – the traditional New Year Festival of Khmer people in the south, which falls from April 14-16 this year. The majority of Khmer people in the south concentrate in nine Mekong Delta localities of Soc Trang, Tra Vinh, Kien Giang, An Giang, Bac Lieu, Ca Mau, Vinh Long, Hau Giang, Can Tho. There are also Khmer people living in Ho Chi Minh City and southeastern localities. During the festival, Khmer people conduct many traditional rituals such as pagoda visiting and Buddha bathing, aiming to pray for favourable weather conditions and good luck for family members, as well as showing gratitude to parents and ancestors. Addressing the event, PM Phuc extended his New Year wishes to the Khmer community, which number around 1.3 million. He underscored that Vietnam is a united country with a large number of ethnic groups. The Party and State always pay special attention to ethnic minority groups, including the Khmer. He said that the Government has prioritised resources for many national schemes designed to support the disadvantaged groups, including ethnic minority people, such as the sustainable poverty reduction programme and the new-style rural area building programme. The Government leader expressed his delight at improvements in the living conditions of the Khmer community, as well as in education and human resources quality. The political system in Khmer-inhabited areas has been reinforced with increasing number of Khmer officials. The solidarity among religions and ethnic groups has been promoted, while political security and social order and safety have been ensured, he noted. However, the PM pointed out that the socio-economic infrastructure system in the southern region in general and Khmer areas in particular has yet to meet development requirement. The income and livelihoods of for part of community, especially those in remote and mountainous regions, have been unstable. 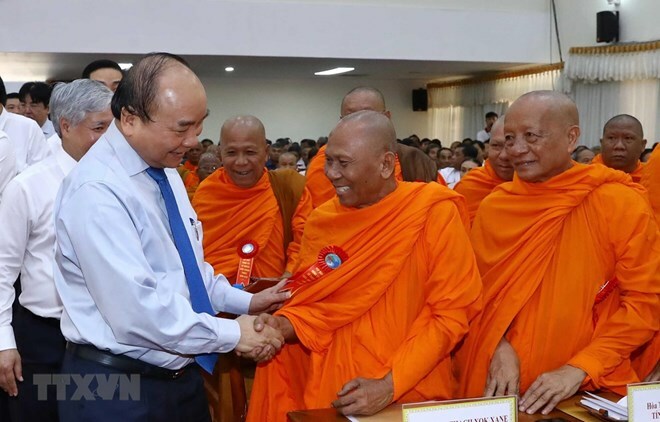 The human resource quality has yet to meet the requirements for industrialization and modernization, he said, adding that there are still activities of abusing religions to harm solidarity among Khmer people. He requested ministries, sectors and regional localities to actively carry out policies related to ethnic and religious affairs, meeting aspiration of the groups. It is necessary to give more resources to localities that are home to ethnic minority groups to boost socio-economic growth and climate change response, he said, stressing the need to encourage startups and job generation so as not to leave any one behind. The PM asked authorised agencies to promote the popularization of policy and legal regulations among Khmer people, while creating favourable conditions for religious activities of the group.